Monasterio de San Juan de los Reyes – (English: Monastery of Saint John of the Kings). 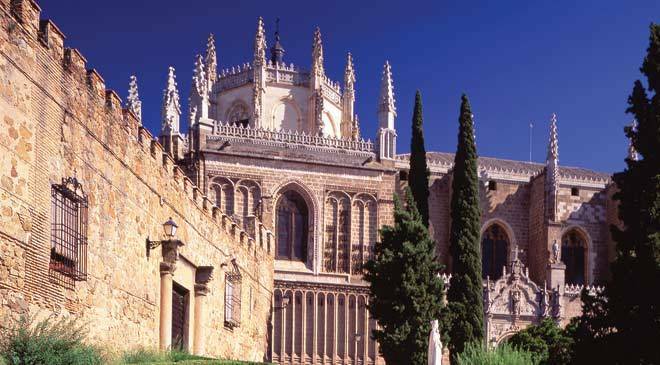 This monastery was founded by King Ferdinand II of Aragon and Queen Isabella I of Castile to commemorate both the birth of their son, Prince John, and their victory at the Battle of Toro (1476). Toledo was chosen as the site for building the monastery due to its central geographic location and because it had been the capital of the ancient Visigoth kingdom. – Taken from Wikipedia.org. This monastery, one of three in Spain, is the most logical place for the Catholic Elite to settle for the After-Time, it’s Spain central: politically and geographically. The history of the Vatican Observatory is complex. Established at the Roman College of Rome in 1774, it was moved and shutdown at various times throughout it’s 239 year existence. Due to the degradation of viewing conditions it was finally moved to Mount Graham in Arizona where it enjoys the best locations for land-based observatories in the continental U.S. 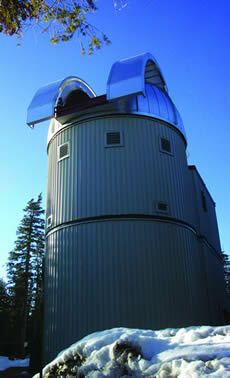 Although the headquarters of the Vatican Observatory remain in Italy at Castel Gandolfo. It is my opinion that Arizona location was also chosen due to it’s well-known geographical stability against Earth changes as detailed by ZetaTalk. Ever since Joseph Ratzinger (Pope Benedict XVI) announced his Papal resignation on February 11th, I had feeling that he was avoiding something. Since he is the first pope to resign voluntarily since Celestine V more than seven centuries ago, I wondered about his motives. 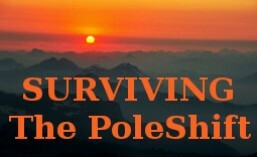 Thinking to myself, well it has to be something to do with the Pole-Shift, still, the Pope is elderly at 85 year old, but I couldn’t put my finger on it: As is said by the Zetas: “(He) is struggling with poor health, he is 85 years old! That he had a minor stroke and is taking heart medication.” But, as the Zetas go on to say: “(this) is hardly a reason to resign.” I just couldn’t let this religious-political event pass as Popes have a long tradition of taking their papacies to the grave. I remembered reading some ZetaTalk a few years ago about Spain being the country that the Vatican elite are interested in as a retreat for the After-Time, but it’s too soon for the ex-Pope to run for the plateaus of Spain. These extremely powerful public figures have intelligent advisers, that we know and their actions are carefully counselled to avoid triggering public suspicion. Let’s take a look at where Ratzinger would hole-up for the After-Time: there are a total of three Catholic monasteries in Span: Sagrada Família near Barcelona on the coast, the much smaller Monastery of Iranzu near the city of Corella about 60 Km from the Pyrenees and finally the “Monasterio de San Juan de los Reyes” in the city of Toledo. My opinion is that the Papal retiree could be found in this Toledo location in the After-Time since it is situated in the center of Spain and at a height of 529 m (1,736 ft), it’s a safe location against the massive poleshift waves. In fact, I wouldn’t be surprized if Ratzinger would move there bearing gifts from the Catholic Church within a year or so. I believe this, as the European Tsunami will kill many Catholics and dramatically effect all public services in Europe making Life more difficult there, which would only worsen as the Pole-Shift looms. Furthermore, I surmize, that such a man as Joseph Ratzinger would prefer not to be prevented from enjoying his retirement by being in Italy, thus more-or-less accessible, having to attend to the grieving by many of his admirers. It is well known by the privileged and the powerful of the Holy See that the Mediterranean area will have two pre-Pole-Shift assaults: the African Roll and the European Tsunami. Of course, the Pole-Shift ravages Italy, so this is a good time to free up oneself for a quick exit, when it becomes necessary. One has to ask: “Why an observatory?” Of all scientific pursuits to pursue and support, why would it be the one discipline that looks to the skies? The Vatican has access to old manuscripts held in the Vatican Archive, many of which have stories about raining fire and boulders dropping from the sky, unbelievable to the average person, but which makes a whole lot of sense when you read Velikovsky, Sitchin or ZetaTalk. Take the story of “The Parting of the Red Sea”. The Zetas explain that this event did indeed happen as this was the time of the last passage of Nibiru. Father Malachi has personally read the Third Secret of Fátima document. This photo was most likely taken at Sister Lucy’s last public interview on December 26, 1957, after that, permission was refused for any other interviews and she was effectively silenced and completely hidden away for the next several decades. – Taken from avangelista – wordpress.com. The modern hierarchy of the Catholic church was given a warning about the Pole-Shift with the famous: “Third Secret of Fátima”. The person at the center of the Third secret of the Fátima was Carmelite nun, Sister Lucia (born Lucia Santos in Aljustrel, Portugal on March 22, 1907 and died on February 13, 2005 at 97 years of age). At ten years of age, she and two other Portuguese children, cousins Francisco and Jacinta Marto aged nine and seven, collectively experienced a series of cohesive spiritual visions in the town of Fátima, Portugal, sometime between May and October 1917. Now known as “The children of the Fátima”, it is told that they received these visions from the “Lady of the Rosary” around noon on the 13th day of each month. At one point, the horror of the Third Secret “sent them screaming in horror, writhing on the ground”. Sister Lucia’s two cousins were both victims of the Great Spanish Flu epidemic of 1918-1920, leaving Sister Lucia the sole bearer of the Earthly information of the visionary message. This, the secret of the Fátima, was written down by Sister Lucia in 1944 in three parts, and was formally passed to the Vatican in 1957 in a sealed envelope. The Zetas say that Sister Lucia was “sworn to silence” on the matter and banished to a Life of being a “cloistered nun”, which basically means Catholic house arrest. Each successive pope thereafter, maintained the cover-up on the Third Secret. But what was the content of the letter? Although the original letter is locked in the archives of the Vatican, a source “close to the Vatican” has revealed some of the text: “A star, the Asteroid , will illuminate the earth causing it to appear to be surrounded by flames during a period of some twenty minutes, an event which will spread panic everywhere… This will occur in the near future. When the Asteroid lights up the earth making it appear that the whole world is in flames, many people will wish to die at that shower of fire… a fear which will in fact cause the death of many people…“. Clearly, as in many other writings, this is a general description for the events of the passing of Nibiru and the the effects of it’s massive tail passing near Earth during the hours before and during the Pole-Shift event itself. So what do the Zetas of ZetaTalk have to say about the recent Papal retiring? This is all linked to Obama’s announcement of the presence of Planet X in our solar system that the Zetas are saying is in the works. The outgoing Pope is wanting to just “get out of dodge” while the getting is good. With the purported Zeta-Obama announcement in the works, political, economic and public disorganization is highly likely to ensue. This would put a lot of pressure on the Pope in many ways, he is just seeking to avoid that. 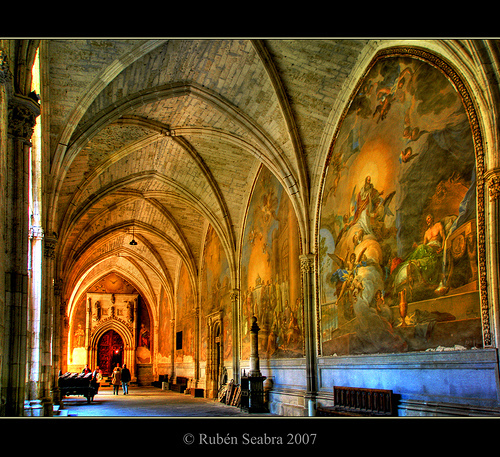 Monasterio de San Juan de los Reyes – Toledo, Spain. This entry was posted in About the Pole-Shift, Political Pole-Shift and tagged 2012, catholic church, pope benedict, pope Benedict XVI retires, pope ratzinger retires, sister lucia, third secret of Fatima, vatican, Zetatalk. Bookmark the permalink. I’ll still be watching for Vatican movement towards Spain as the Poleshift approaches. (ChrisThomas).